Halloween is tomorrow (ahhhhh! 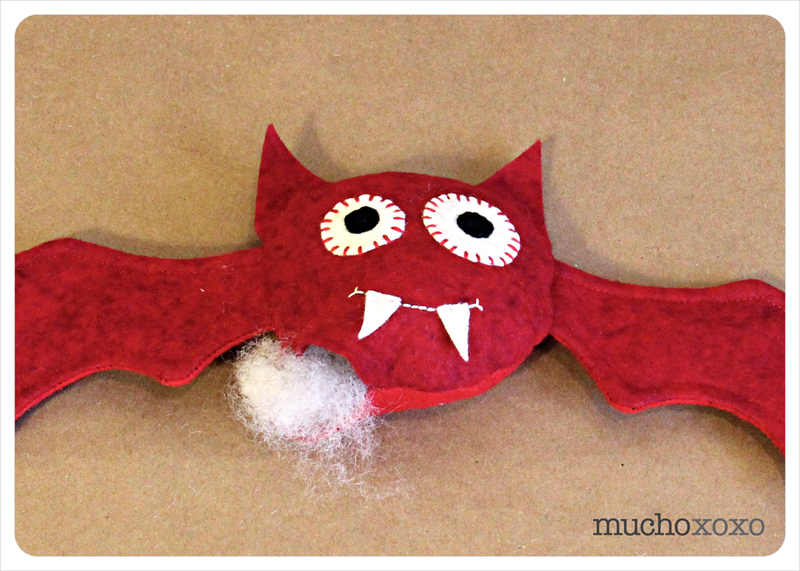 ), but this vampire bat softie was just too cute not to share! This little guy is fairly easy to put together, and makes a great toy or decoration. And adding crinkle material in the wings makes it even more fun! * I used two different shades of red, just for the purpose of this tutorial. 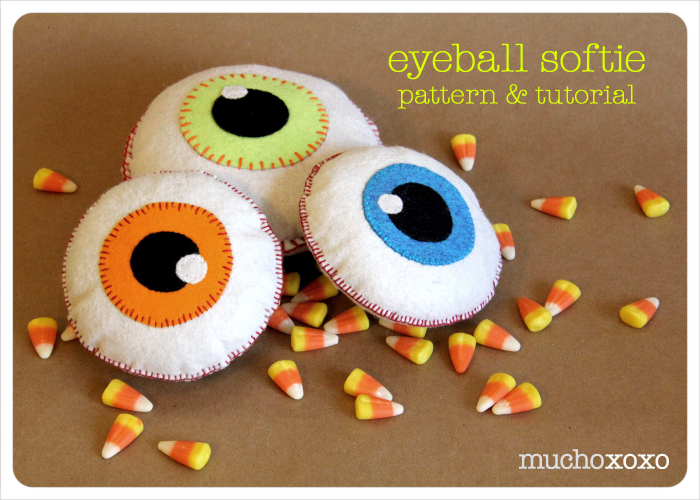 Unlike the eyeball and candy corn softies, I did most of my assembling for this on the sewing machine. 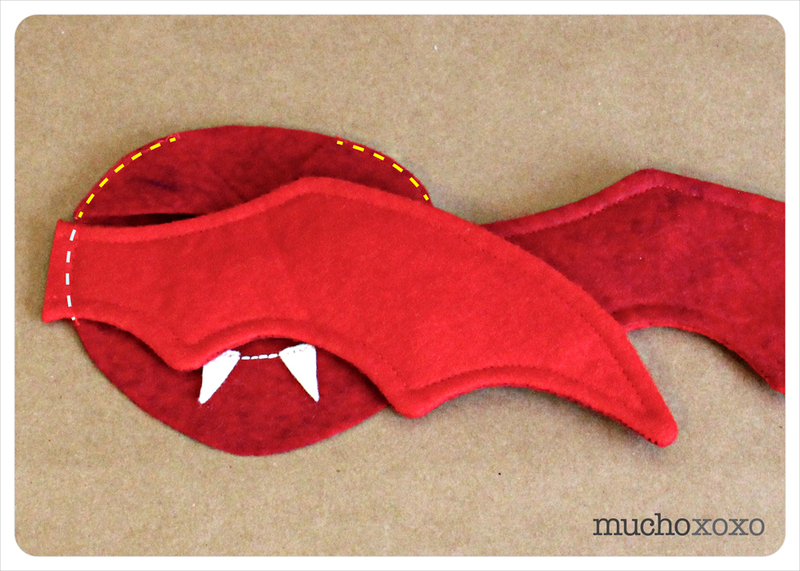 Step 1: print and cut your pattern, then cut your felt pieces. I’d recommend cutting both body pieces at the same time, as well as each pair of wings. Step 2: place your wings right sides together and pin (if you cut them at the same time, you can just leave them as is and pin). 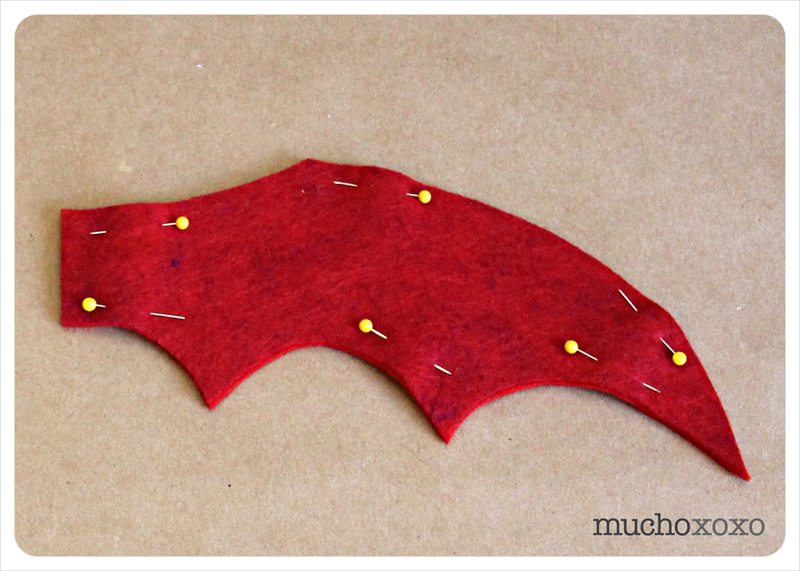 Step 3: sew each pair of wings, leaving the straight end open for turning. Remember to back stitch and the beginning and end. Step 4: trim your corners and clip/notch your curves. Step 5: turn your wings right side out. It’s a bit of a tight squeeze so take your time. You can use a chopstick to help with the corners. Step 6: iron the wings and then topstitch. Again, leave the straight end open. Step 7: stuff each wing with a small amount of crinkle material (optional). You can use a chopstick so make sure it’s spread evenly and reaches the tips. Set the wings aside and move on to the body. Step 8: sew your face to the front body piece. I placed my eyes first and then drew my mouth with disappearing ink and used a simple back stitch. Step 9: once you’ve finished the face, you’re ready to assemble. I would recommend stitching the ears and wings into place. I did this on the machine with a larger stitch, as close to the edge as I could get (indicated by the dotted lines below). This will ensure that nothing moves around while you’re sewing the body. Step 10: time to pin! Fold in your wings so they are as compact as you can get them. Pin all around. Where the wings stick out will be your opening for turning and stuffing. Step 11: sew the body. Don’t forget to back stitch at the beginning and end. I also backstitched over the edges of the wings, just to reinforce them. Trim your wing excess and clip your curves when you’re finished. Step 12: turn your bat right side out. I’ve found that if you hold the opening with one hand and gently tug the wings with the other, it will start to turn fairly easily. Once it’s right side out, give the ears and wings a little tug to make sure they’re fully out. Step 13: stuff with crinkle material (optional) and stuffing. Use small pieces of stuffing to ensure you get it nice and full. Step 14: when you’re done stuffing, close up your opening with a ladder stitch. If you’re unfamiliar with the ladder stitch or need a refresher, check out this great tutorial with very clear step-by-step instructions. You may want to add a bit more stuffing as you close the opening. Once you’ve reached your starting point, tie it off, bury your thread and trim. And that’s it! 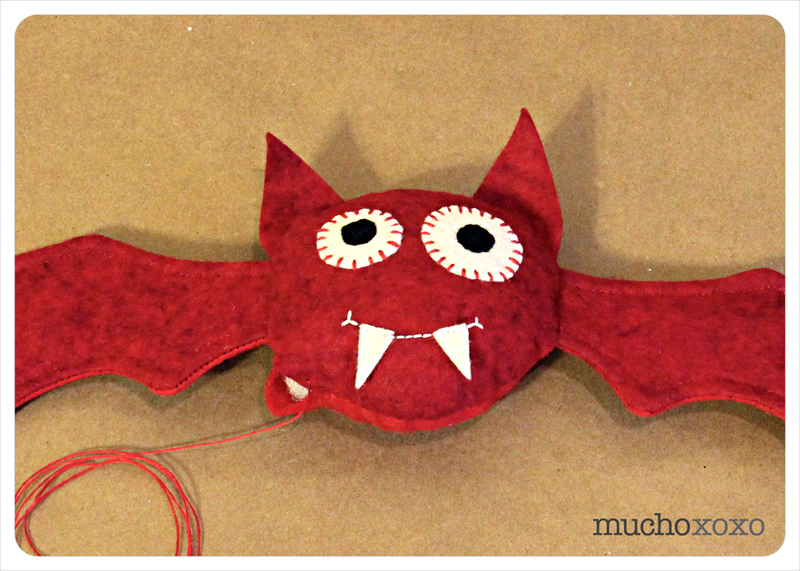 A little vampire bat buddy to keep you company! So much cuter than the real thing, huh? 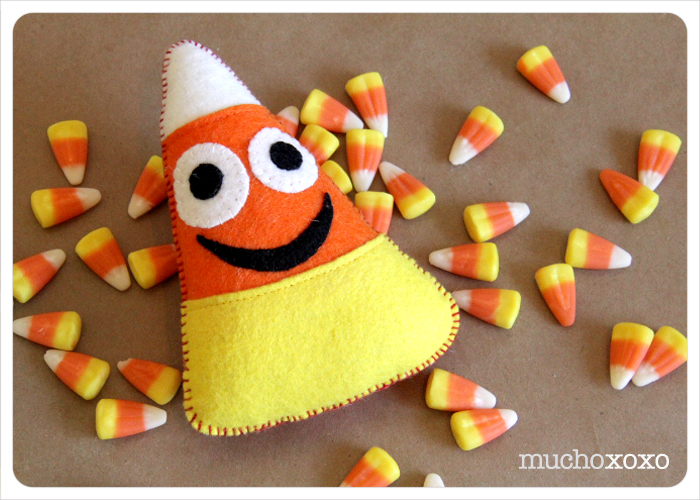 It’s just not Halloween without candy corn! Here’s another fun project that comes together in a flash. These make great decorations, or you can add some crinkle material and a rattle insert for a fun toy for your little one! These would also be a fun addition to the kids’ table on Thanksgiving. This is a fast and easy project that can be done by hand or on the machine. 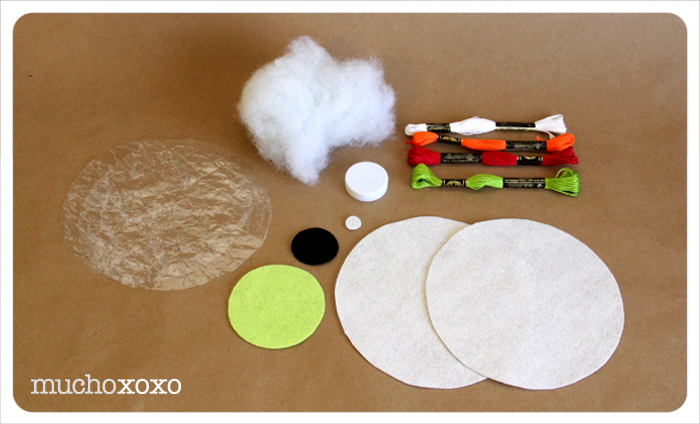 Step 1: print and cut your pattern and then cut your felt pieces. Step 2: sew your white/orange/yellow strips together. I used the solid back piece as a guide for lining up my strips (shown below left). I did this step on the machine, sewing fairly close to the edge. Since I will be hand stitching the rest, I chose not to backstitch at the end of each row. Instead, I pulled the thread through to the back and tied it off. Step 3: sew your face to the assembled front piece. If you decide to make more than one, consider giving them all slightly different expressions. (btw, they’re also pretty cute without a face). 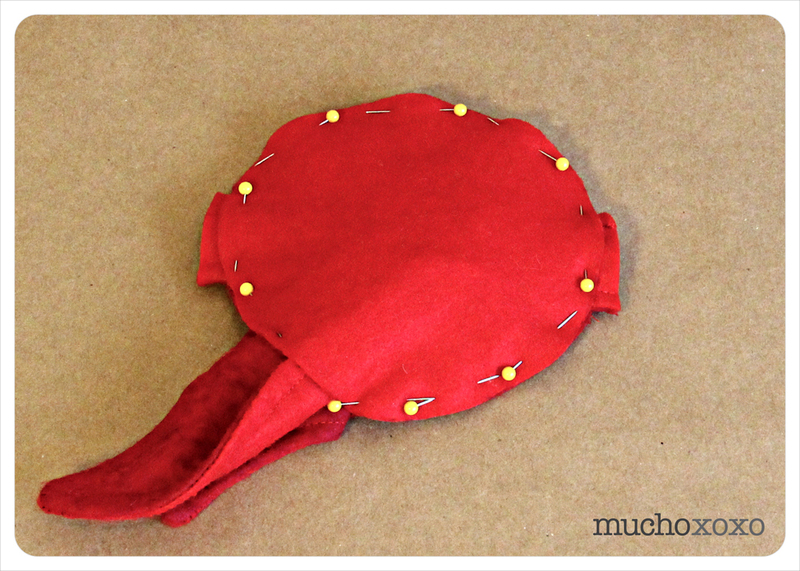 Step 4: if you choose to add interfacing, now’s the time (I used Pellon Shape Flex). I would recommend this step especially if you plan to hand stitch your pieces. It adds a little reinforcement to the felt. I opted to iron and trim it after I sewed the strips together and added the face. It covers up the stitching and fabric flaps nicely so you won’t have to worry about snagging it when you add the stuffing. And the blanket stitch does a great job of hiding your edges, in case you’re worried about the interfacing showing. Step 5: once you’re happy with the look of your face, place your finished front piece on top of the back piece, wrong sides together, and pin. 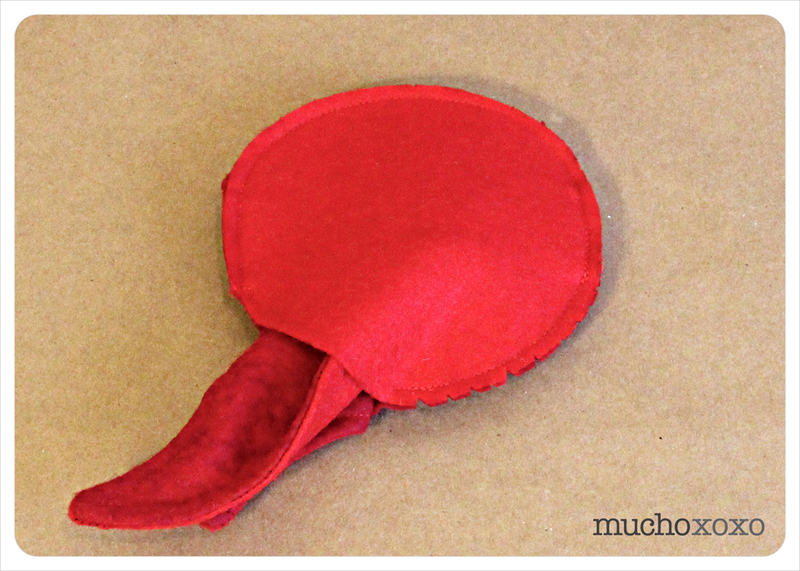 Step 6: blanket stitch your pieces together, leaving a 2” opening. If you’re unfamiliar with the blanket stitch or need a refresher, check out this great project with very clear step-by-step instructions. The blanket stitch uses a surprising amount of thread and can vary greatly depending on how close you place your stitches, so be prepared! Step 7: stuff with crinkle material (optional) and stuffing. Use small pieces of stuffing to ensure you get it nice and full. If you choose to add a rattle insert, try to place it towards the center. Not sure where to purchase crinkle material or rattle inserts? I get mine here. Step 8: when you’re done stuffing, continue your blanket stitch to close up the opening. You may want to add a bit more stuffing as you close the opening. Once you’ve reached your starting point, tie it off, bury your thread and trim. 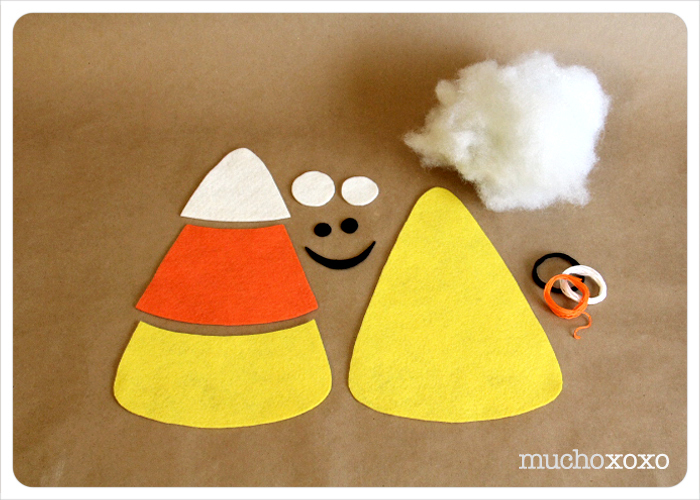 And that’s it, a candy corn buddy that’s good enough to eat! Halloween is quickly approaching (eek! 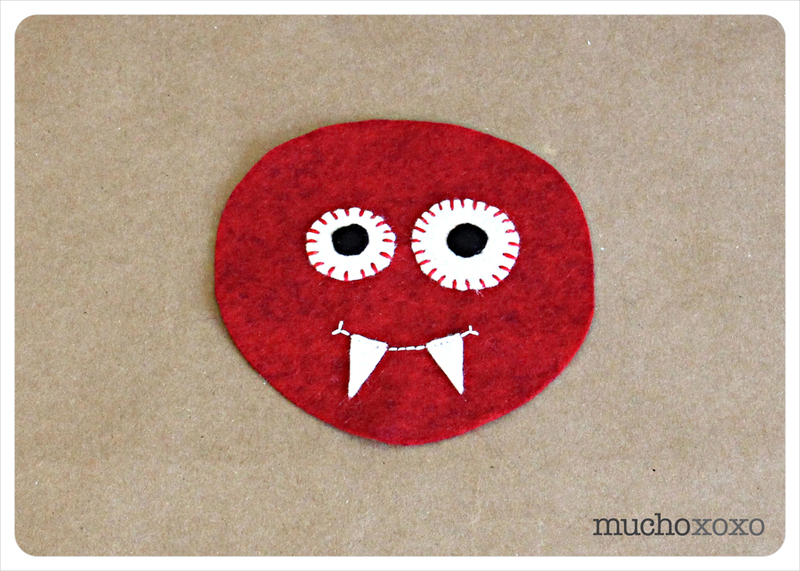 ), so I decided to get into the spirit with some fun and easy felt projects. First up, a big eyeball! These make great decorations, or you can add some crinkle material and a rattle insert for a fun and [not too] spooky toy for a little one! 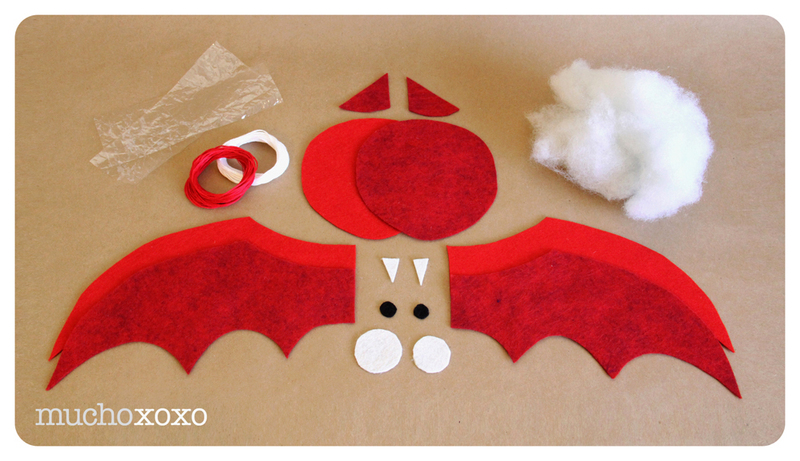 Step 1: print and cut your pattern and then cut your felt pieces. (2 large white circles for eyeball, 1 colored circle for iris, 1 black circle for pupil and 1 very small white circle for the highlight). If you’re going to use crinkle material, cut it slightly smaller than the large circle. Step 2: attach the iris, pupil and highlight to one of the large white circles with embroidery thread. I chose a contrasting color to stand out against the green (reminds me of a poisonous frog). The color combos are endless, so have fun with it! Optional – you can add red stitching radiating in from the edges to make the eye look bloodshot. 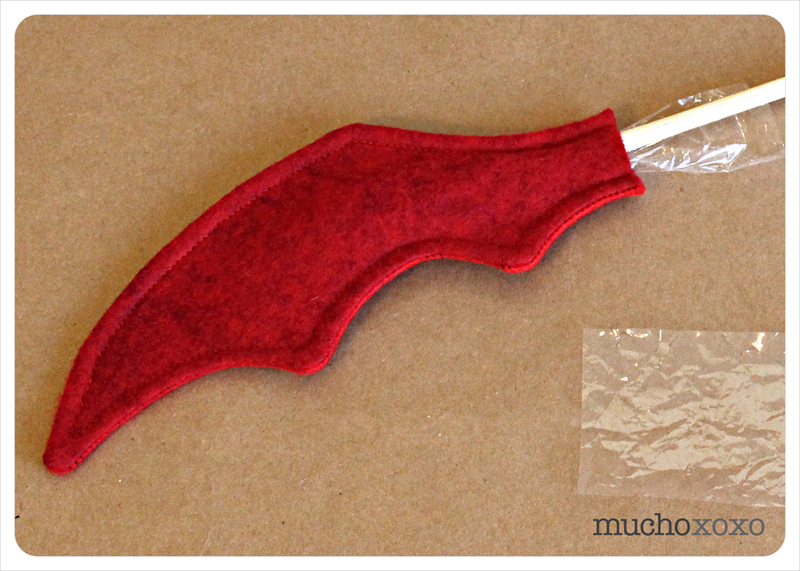 Step 3: if you choose to add interfacing, now’s the time (I used Pellon Shape Flex). I would recommend this step especially if you plan to hand stitch your pieces. It adds a little reinforcement to the felt. I opted to iron and trim it after I sewed the iris/pupil/highlight. It covers up the stitching nicely (shown below right) and you won’t have to worry about snagging it when you add the stuffing. And the blanket stitch does a great job of hiding your edges, in case you’re worried about the interfacing showing. Step 4: once you’re happy with the look of your eye, place your finished front piece on top of the second white circle, wrong sides together, and pin. 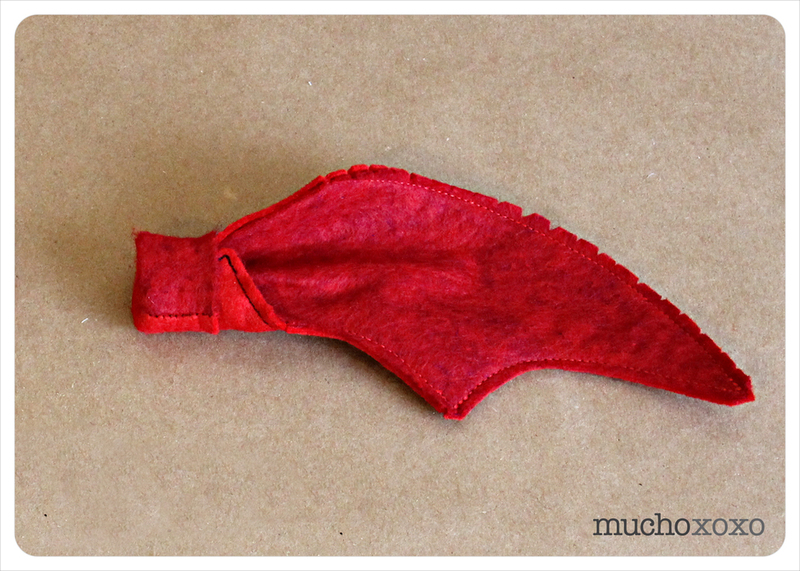 Step 5: blanket stitch your pieces together, leaving a 2” opening. 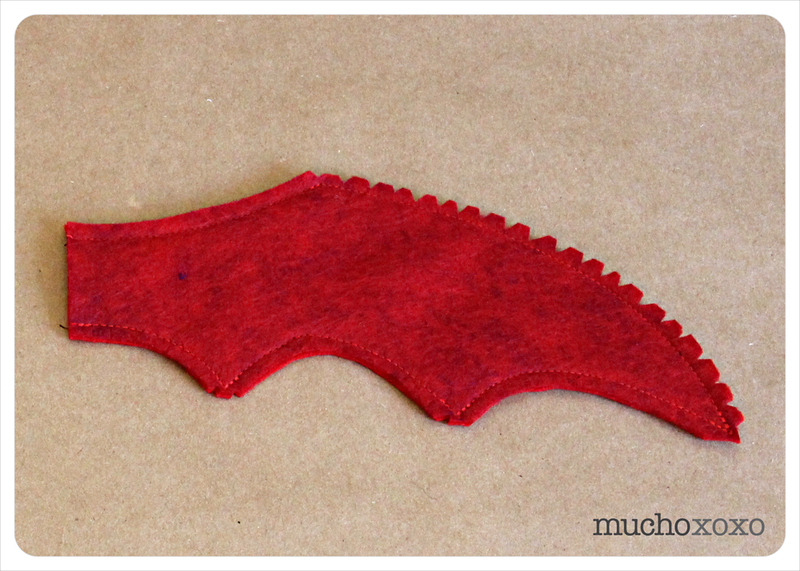 I used red embroidery thread to make it look a little bloodshot. If you’re unfamiliar with the blanket stitch or need a refresher, check out this great project with very clear step-by-step instructions. The blanket stitch uses a surprising amount of thread and can vary greatly depending on how close you place your stitches, so be prepared! Step 6: stuff with crinkle material (optional) and stuffing. Use small pieces of stuffing to ensure you get it nice and full. Step 7: when you’re done stuffing, continue your blanket stitch to close up the opening. You may want to add a bit more stuffing as you close the opening. Once you’ve reached your starting point, tie it off, bury your thread and trim. And that’s it, a spooky eyeball of your very own! Couldn’t be easier, right? Go ahead, make a bunch! Are you on bloglovin’? Hey, me too! Come say hi!